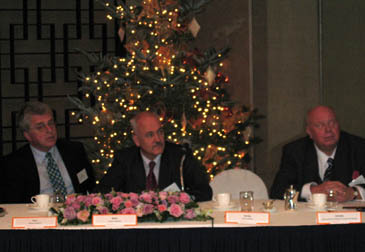 Gerhart Maier (center), president of Invest in Germany GmbH, listens to a speaker along with Claus Auer (left), deputy head of the German Embassy, and Siegfried Scheibe, director of the Korean-German Chamber of Commerce and Industry, during a press conference on German investment at a Seoul hotel Dec. 20. Germany is one of the most attractive places in the world for Korean investors, especially in the high-tech sector, and sports could be an important factor, German experts say. "Besides our high technology, we are also taking advantage of the 2006 FIFA World Cup and other sports events, like Sunday's friendly match between Korean and German national soccer teams to promote Korean investment in our country," said Gerhart Maier, president of Invest in Germany GmbH, in a press conference in Seoul on Dec. 20. Invest in Germany is a Berlin-based investment promotion agency funded by the German federal government. Germany lost 1-3 to Korea in the friendly match at the Busan Asiad Stadium in Busan. Also attended the press conference were German Prof. Peter M. Herzig, director of the Leibniz Institute of Marine Sciences University of Kiel; Dr. Claus Auer, deputy head of the German Embassy in Seoul; Dr. Rainer Mueller of Invest in Germany GmbH; and Siegfried Scheibe, director of the Korean-German Chamber of Commerce and Industry. 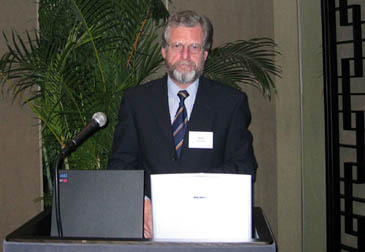 Prof. Peter Herzig (at the podium), director of the Leibniz Institute of Marine Sciences University of Kiel, delivers a special lecture on foreign investment in Germany during a press conference at a Seoul hotel on Dec. 20. Prof. Herzig delivered a special lecture on investment in Germany at the press conference, organized by the Korean-German Chamber of Commerce and Industry in cooperation with the German Federal Ministry of Economics and Labor. He cited 10 factors why Germany is the most attractive place for Korean investors to do business. "Among others, Germany is the largest market in Europe with a population of 82 million and Germany is located at the center of Europe with easy access to Eastern Europe," Prof. Herzig said. He also pointed out, "Germany enjoys lots of advantages in connection with the European Union's expanded business projects for Eastern Europe." Germany has lots of small- and medium-sized companies with advanced technology and competitiveness, Prof. Herzig said, adding that Germany has good legal and social systems. He also mentioned that Germany is a global country with more than 22,000 foreign companies, including about 500 well-known global firms, doing business. "Germany has both established global companies and young, innovative firms." 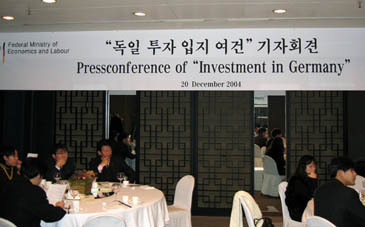 Korean journalists attend a press conference on "Investment in Germany"at a Seoul hotel on Dec. 20. The press conference was organized by the Korean-German Chamber of Commerce and Industry in cooperation with the German Federal Ministry of Economics and Labor. The other factors Prof. Herzig cited were Germany's high productivity, good work force and improved investment environments mainly thanks to the ongoing German federal government's reform agenda. "The German government will continue to strive to promote foreign investment in Germany on the occasion of the 2006 FIFA World Cup by raising its national images of openness and hospitality," he said. Germany is one of the most active and largest investors in Korea. The German investment promotion team, including Mr. Maier and Prof. Herzig, attended an investment explanatory session for Korean investors in Busan on Sunday and later in the day visited the Busan Asiad Stadium for the Korean-German national soccer match. Among the attendees at the Busan investment seminar was Cha Bum-kun, head coach of the Suwon Samsung. Cha once played for such German soccer teams as Eintracht Frankfurt and Bayer Leverkusen. Accompanying their national soccer team, the German investment promotion team also visited Yokohama, Japan for similar investment seminar. The German national soccer team defeated its Japanese counterpart 3-0 in a friendly soccer match on Dec. 16 at the Yokohama National Stadium.